I see numerous questions each day that contain clear indicators of off-site resource (usually a tool) recommendation requests. Very often, those questions contain "What library" or similar wording. If we can narrow it down to the most-used phrases (with a low false-positive rating), can we show a warning message to the user (or just new ones), not to post tool recommendation requests? Or will they just end up posting anyway? Over 50% of the similar sounding Questions are closed, are you sure this is in Scope. 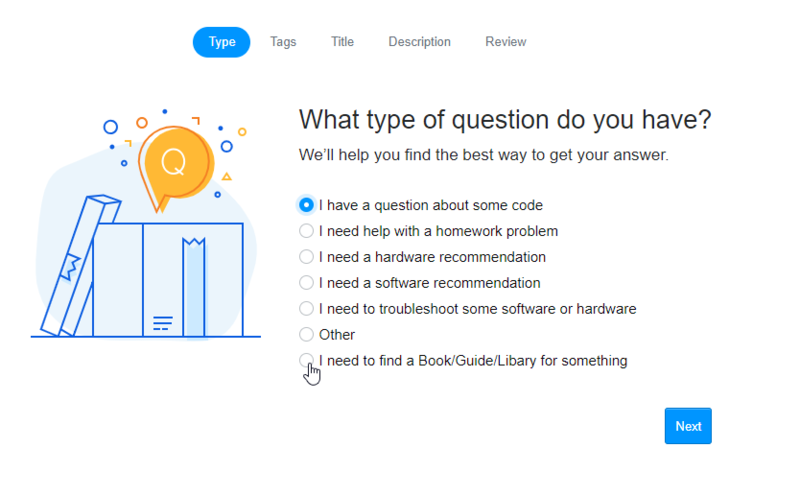 The probably best solution with the least false positives would be to add a new Type: "I need to find a Book/Guide/Library" like we have with "I need a software recommendation". For that we should consider if the "hardware/software" recommendations options worked and actually reduced the off-topic questions and so make this option possible and useful. PLASMA chicken is a new contributor to this site. Take care in asking for clarification, commenting, and answering. Check out our Code of Conduct. Not the answer you're looking for? Browse other questions tagged discussion scope asking-questions recommendation-questions . When someone asks for a recommendation instead of a question, where should I tell them to post their question? Yahoo answers? When is asking for a recommendation on-topic?